INDICATE Strategy and future plan workshop, which was held in Paris on 7th of June 2012, gave the opportunity to exchange on good practices and collaborations between the digital culture heritage sector and einfrastructures, and to give common trails for further cooperation. for the DCH community: cultural managers will access services provided by e-infrastructures such as storage, preservation, access services for the cultural institutions, etc. for other related sectors: digital cultural content will become more usable and re-usable for education, cultural tourism, long-life learning, non-professional cultural interests, creative industry, etc. The Paris workshop pointed out the importance of fostering international cooperation between digital cultural heritage and e-infrastructures, and with other networks in target regions: the Mediterranean region (Egypt, Turkey and Jordan), China and South America. 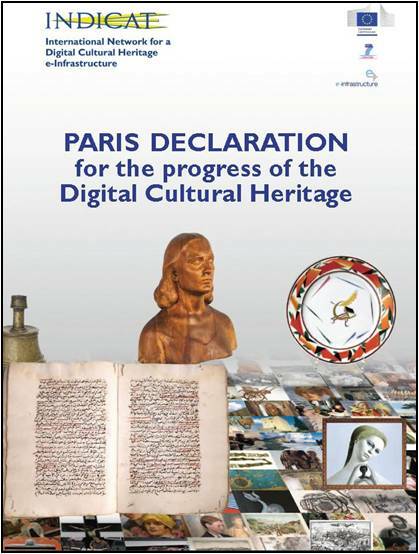 One of the main results of this work is the preparation and signature by all partners of the Paris Declaration, developed in cooperation with DC-NET and Linked Heritage projects. Conceived during the Strategy and future plans workshop and amended during the final INDICATE Conference in Ankara (15th-16th October 2012), this document is a shared vision of the INDICATE network of interest for the progress of Digital Cultural Heritage in future years. 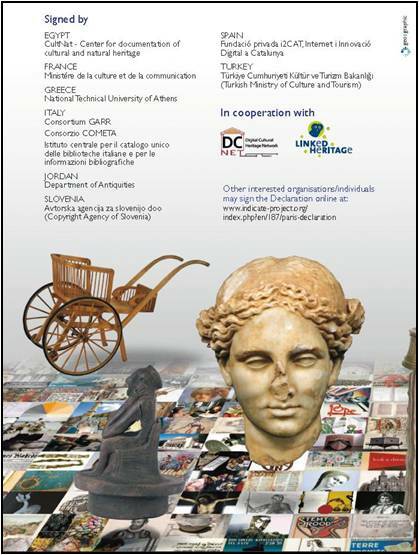 It is a legacy of the project, where the partners commit to support collaboration between cultural heritage, ICT and einfrastructures stakeholders, and it details the future priorities and commitments of the network beyond the lifetime of INDICATE. The shared vision of the INDICATE network is that in ten years' time, access and use of digital cultural heritage will be available to all and that collaboration with the e-Infrastructures community will facilitate realisation of this vision. Download the full text of the Paris Declaration.